Underfloor heating running costs are dependent on a number of factors. Is the room energy efficent – double glazed etc? How high the ceiling is – The higher the ceiling the more heat that’s required . A kilowatt of electricity (1000 watts) costs around 10p per hour (average market price taken, consult your electricity company for exact prices). ezewarm ezemat’s are rated between 160 watts and 200 watts per m/sq. Detailed below are estimated running costs. 1m² of 150 watt costs approx. 1.5 pence per hour. 1m² of 160 watt costs approx. 1.7 pence per hour. 1m² of 200 watt costs approx. 2 pence per hour. If you need an accurate running cost before purchasing please email us your room measurements, what insulation is in pleace and how many hours you wish to use the heating per day. Does it help to have insulation boards? Insulation is always a good idea whether its in the walls, roof or in this instance under floor. If you can install thin insulation boards do so. If using as the only form of heating it is essential there is insulation beneath the heating mats or wire. Insulation makes your property more thermally efficient and the heating more effective. Tile backer insulation boards start at 6mm. Contact us for advice or fax/ email your floor plans so we can estimate if the selected is adequate to heat your room. How long will it take before the floor reaches its set temperature? Depending on the thickness of the ceramic or stone tiles, the warm up time is usually between 30 to 60 minutes. With an insulated or wooden sub-floor this heat up time can be halved! 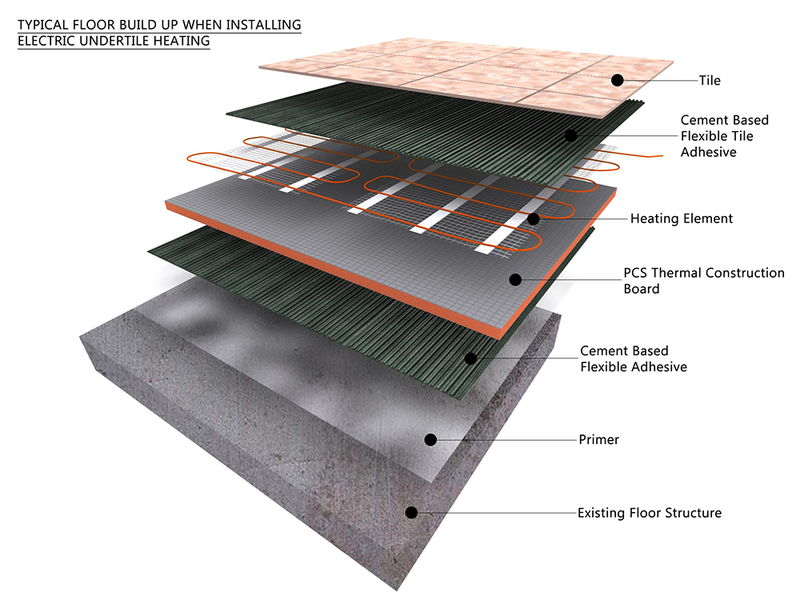 What are the maintence costs for under floor heating? Once installed and tested as per the instructions and the floor is laid on top, the heating mat will not break and is covered by our lifetime guarantee. If it breaks 99.9% of the time it’s due to installer error. We have engineers that cover the whole of the UK. If there is an accident it can be traced down to beneath 1 or 2 tiles. We have never ever had to take up a complete floor. In the majority of instances a 13amp spur will be (but check with your electrician), sufficient. It is easy to calculate the exact load in amps with a simple calculation. Take the area in m² of the heating mat and times it by the power (150,160 or 200watt) of the mat. This calculates the overall watts. Now to work out the load Simply divide this amount by 230 (the volts). Example: for a 10m² 200 watt mat = 10(m²) x 200 watts = 2000 (watts) divide by 230(volts) = 8.7 amps. Once installed correctly and tested correctly see how to test your under floor heating mat or cable on installation electric underfloor heating should never go wrong. If it does stop working it is normally just the thermostat. However ezwarm mats and cable are covered with a manufacturers backed lifetime guarantee. You can call us on 0800 772 0752 or email [email protected], tweet @ufhhq or contact by facebook.